Blackberry crumble bars came about when I decided my craving for blackberries was greater than my determination to save my stash of summer berries I'd frozen for winter. If you don't have such a stash, you can buy two 10-ounce bags of frozen blackberries for this recipe. And don't thaw them; use them frozen. If you're gluten-free, just replace the flour with a combination of 1 cup sorghum flour, 3/4 cup potato starch, 3/4 cup tapioca flour and 1 teaspoon xanthan gum. Gluten-free flour blends require more liquid than wheat flour, so you'll need to add a bit of iced water after stirring in the eggs. Add the water just a spoonful at a time so that you don't overdo it. Cut into 2-inch squares, these crispy-crusted bars don't require a fork and are perfect for afternoon tea. Cut into larger portions, they stand in quite nicely for pie. My Southern grandmother often made Blackberry Cobbler, another way I enjoy blackberries. What's your favorite black(or other)berry dessert? 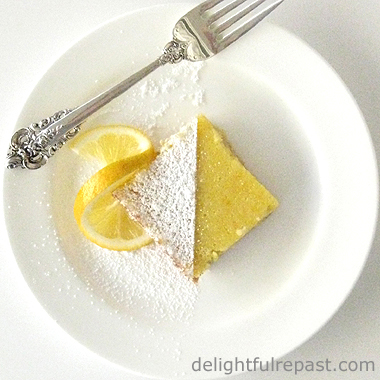 * We like tart rather than sweet so use 1/3 cup sugar and 2 tablespoons lemon juice. 1 Preheat oven to 375F/190C/Gas5. Grease or spray with cooking spray a 13x9x1-inch quarter-sheet pan. If you don't have a quarter-sheet pan (and you really should! ), you may use a 13x9x2-inch pan. Also, you might want to line the pan with baking parchment, leaving enough paper overhanging the ends to use later for lifting the bake out of the pan for cutting. Grease or spray the paper as well. 2 In medium bowl, stir together flour, sugar and salt. Cut in the butter until mixture is like coarse cornmeal with some 1/4-inch chunks remaining. Stir in the beaten eggs to form a dough that clumps together. 3 Pour half the crumble into the prepared pan and press it into a crust just on the bottom; you may need to use a bit more of the reserved crumble. Bake the crust for 15 minutes. Keep the reserved crumble in the refrigerator until needed. 4 In small bowl, stir together sugar, tapioca flour and salt. Spread blackberries over baked crust. Sprinkle sugar mixture evenly over berries, then sprinkle on lemon juice. 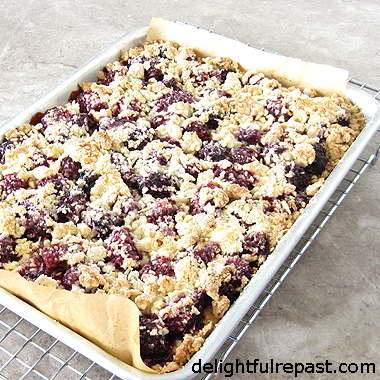 Sprinkle clumps of crumble topping over the berries. Bake until crumble topping is golden and berries are bubbling, which took about 1 hour with my very large frozen berries and small amount of sugar. Note: The baking time will be shorter for fresh berries, thawed berries or smaller berries and likely shorter with the larger amount of sugar. So check on it at 30 minutes and see what's going on in there. 5 Cool in pan on wire rack until completely cool before lifting out the bake on parchment. Or just serve from the pan. Thank you, Angie. We enjoy it so much with our tea in the afternoon. Sully, I'm having the vapors! I need Danny Ray, James Brown's Cape Man, to come and revive me. The coveted 5-Cleavers Award - two in a row! Wow! Looks so delicious. I have fond memories of picking blackberries with Grandmother when I was a little girl. I posted a memory about Snickerdoodles yesterday. This looks YUMMMMMMY!!! I adore all things berry!!!! I need to make this next week!! YUM!!!!! Mildred, that's wonderful! One of my cousins picked berries with our grandmother, but I never had that experience. Thank you, Maristella! And I'm sure you have the perfect china to serve it on as well! Mrs U, thanks, I hope you will! Christine, thank you. And I know you would serve the bars beautifully! Jean, do I need to be nervous my attempt might fall apart / crumble when I cut them? If so, any special tips? Love these fall dessert ideas, thank you. Pauline, thank you. You shouldn't have a problem, as long as in step 2 the dough is wet enough to clump together - not a bunch of dry crumbs. You would need to add just a bit of iced water to the dry bits, if there were any. These look pretty darned fabulous. And I appreciate your mentioning that the cooking time might vary based on berry, sugar, etc. Good advice to check early! Thank you, Jeanie. And I'm glad to hear you appreciated that timing information. I sometimes wonder if I give too *much* detail. 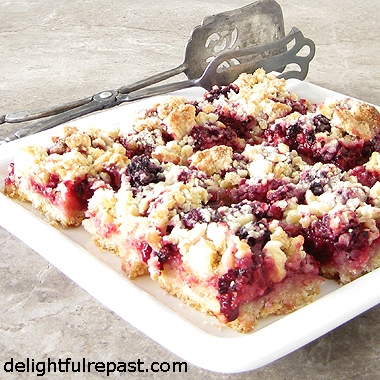 I love, love, love all things berry, Jean, and crumble bars look fabulous! What a treat they would be for me to enjoy. Yes, I have a quarter sheet pan! Actually I have two of them and use them so much. Thanks for another wonderful recipe!! Uummmm, am I the only one who picks blackberries straight into my gaping, baby bird like mouth? Hmmm, all alone, am I then? Okay. Thank you, Kitty! And I'm happy to hear you have two quarter-sheet pans, as do I. I don't know anyone else who has them. Visitors find them a novelty in my kitchen. Mrs Shoes, you are not alone. I'm afraid to plant a blackberry bush for fear they would never make it into the kitchen. That's what happens when I plant peas. I pop open the pods as I pick them! 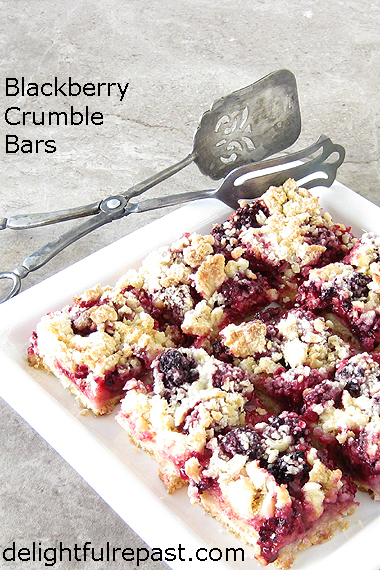 Your blackberry crumble bars look amazing, Jean. I wish I had one to go with my coffee right now. Your grandmother's blackberry cobbler sounds Yummy too. What a nice memory you have of her. I've been eating blackberry jam with my toast, and oh, so good. Sheri, thank you. I love blackberry jam on toast, too - and blueberries in any form! Thanks, Margie. We had one of these with a cup of tea this afternoon. Mr Delightful is already asking for another batch. I guess I can't pick a favourite berry dessert either. They're all good although I do like strawberries best as far as berries themselves go. Your bars look wonderful, Jean! What a treat these bars are. I like that there is not much sugar in them. We call this Streuselkuchen in Germany. Thanks for the recipe. Thanks, Sandi! They go great with tea. I rarely cook a strawberry, except for jam, because they're so perfect in their raw state. Gerlinde, thank you. And thanks for telling me the German name. Streuselkuchen - I like it! I didn't find the time to pick blackberries this year so I'd have to buy some but this looks totally worth it!!! Thanks, Richard! I wish I had a free blackberry source! I used to have access to blackberry bushes when my friend was caretaker at a rural property. Unfortunately, that property was eventually "developed." That certainly looks and sounds good. I haven't had a lot of blackberry experience but this dessert really looks to delicious not to try. I'm pinning and making it soon. Marisa, thank you so much. I'm sure you're going to like blackberries! Looks wonderful Jean, but I'll substitute blueberries...was blackberried out growing up and now abhor them! Lol! But the recipe looks like I can easily substitute. Have a lovely week and thanks for linking to Tuesday Cuppa Tea! Thank you, Ruth. And, yes, blueberries will work beautifully. You sound about blueberries like my father did about chicken. He got chickened out growing up and would hardly touch it for the rest of his days! Looks wonderful! I have a ton of blackberries that I froze this summer so this would be a fun thing to make over the Thanksgiving holiday I think! Lauren, I'm so jealous - my stash of frozen blackberries is dwindling fast and may not last into November! These indeed look yummy! Streuselkuchen, yes! Haven’t had that since living in Germany many years ago. I must make this and relive the old memories. The berries are making my mouth water. I have pinned to my Berries Dessert Board. Please come and share on Friday Features Linky Party today. Susan, thanks. What a wonderful experience to have lived in Germany for a time. I hope my unintentional Streuselkuchen will kindle warm memories! Karren, thanks so much. And I will share the link at your party! My tongue is hanging out right now for one of these bars, Jean!! Pinning!! They sound lovely - a great use for the late summer harvest. I do love a crumble now and then but my wife loves cold crumble for breakfast and I think these would suit her very well indeed. I must admit that if I get around to collecting blackberries I tend to use them to make liqueur these days. Must be a sign of age. Aaw, Debbie, that's sweet! Thank you. Debbie, thanks! And unlike regular blackberry crumble, this cuts neatly into tidy bars that can be eaten out of hand. You temptress! Too many good desserts lately. I haven't even stepped into the Apple Pie yet...now these! Being in blackberry country, this is a most appropriately delicious recipe to put before me. Yummy! Thank you, Sue! I know I get out of balance, posting too many desserts. I need to sneak in a main dish once in a while! They look beautiful and I know they are delicious! Jean: This sure looks delightful! Your recipes are always outstanding. My computer is on the blitz so no party this week! Thank you though for the time you take to always participate! I pinned these posts every week in the hopes that one day I'll get to try them. They look so good on your blog! Well now...those look amazing. Great photos! This looks just wonderful, we grew up eating wild blackberries and my dad used to make blackberry jam. How I would love a slice (or two) of your lovely recipe. The Blogger's Pit Stop is going to FEATURE this post. Oh Jean! That looks amazing! We will have to try it! Thanks! Lily - I'm back around again and glad to be able to catch-up on your posts! Bernideen, thank you! I hope you get your computer problem taken care of soon. That is so frustrating. Sugar, thank you so much! That is so sweet! Dear Janice, thank you. I do love recipes that pull up wonderful old memories. Thank you, Ellen! I wasn't sure about the photos - Foodgawker didn't like my artsy angle! Kathleen, thank you for sharing your blackberry memory (my dad loved to eat the berry jam, but he never made it!) and for featuring my bars. Tony, you are so funny! :D I never buy packaged baked goods, so didn't realize how pricey they are. Yikes! Lily, that's great. Glad to have you back around! I think you'll like these all right! I think it was definitely worth using your berry stash for these! My freezer always has an abundance of blackberries so I am happy to find new recipes to try them in! Thanks, BRnLC. How about if we trade freezers?! Look at those! Oh I just love crumble anything and these are amazing looking. A certain time of the year we get some delicious blackberries in at the market so I must try this then. Debbie, thanks so much. I know you have your hands full just now, so I especially appreciate your taking the time to visit.